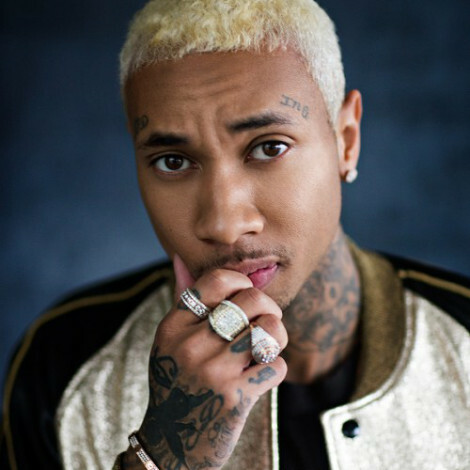 Tyga went all fierce as he invited Dujour magazine into his home for a rather 'bizzare' and fierce photoshoot involving naked Kylie Jenner look-alike Mannequins.Some say the shoot makes him look more like a pervert . "As a photo crew and styling team lug gear up the 26-year-old rapper's steep stone driveway, a young, bleary-eyed Kylie Jenner lookalike is huddled outside the gate, shivering in the light drizzle. Chez Tyga is one of six houses on a locked-off street high above the Sunset Strip, with no visible address, reachable only by the kind of byzantine, narrow roads that make UPS drivers hold their breath. The girl's hair is matted and slept-on, the extension tape visible from the back, and she taps her toe nervously while awaiting her ride. She is clearly wearing last night's shorts." "You learn something by just having a conversation with him,". "And he listens, and that's the thing I do...I listen to everybody and then I take it and put my own thought on it. That's just how life is. God puts us in places. It's for you to make the decision whether you go left or right."